It seems that the BBFC have been at the sherry again, as they have just passed the infamous cult German shocker "Nekromantik" fully uncut for a UK release. Originally made back in 1988, the film revolves around a young man, who's job it is to clear up after motorway accidents, who brings a corpse home for him and his partner to enjoy as they both have a necrophillia fetish. The film has taken this long for it to be picked up for distribution here as distributors feared it would be rejected outright by the UK censors, owing to the films subject matter. But Arrow films, who have spent the last few years releasing many previously controversial titles, announced on May 29th that they had recently acquired the rights to this title and that the BBFC had passed it uncut. Must say this comes as a hell of a surprise given the BBFCs track record on sexual violence and the Govts laws on depictions of "extreme" fetish material (even though this is not strictly a "fetish" movie). But I'm not compaining. A formal release date has yet to be announced. "Cold in July" comes to UK cinemas this June. Jake West and Marc Morris's new documentary "Video Nasties : Draconian Days" is getting a special screening at the Prince Charles Cinema London July 3rd. One for my US readers. Now in its 12th year the spectacular New York City Horror Film Festival, giving a platform to new and independent international horror film, returns for another grand weekend, November 13–16 on the twin screens of the Tribeca Cinemas, at 54 Varick Street, just south of Canal street. The festival opens Thursday, Nov. 13 at 7 pm with a gala opening-night premiere film announced in October. The 2014 Michael J. Hein Award for Personal Achievement in Acting will be given to a very special guest on Saturday, Nov. 15. and we'll be announcing our Lifetime Achievement this Award recipient October as well. Michael J. Hein created the New York City Horror Film Festival in 2002 to offer a needed platform for the independent filmmakers of modern horror films and continued his work until his untimely passing in 2012. 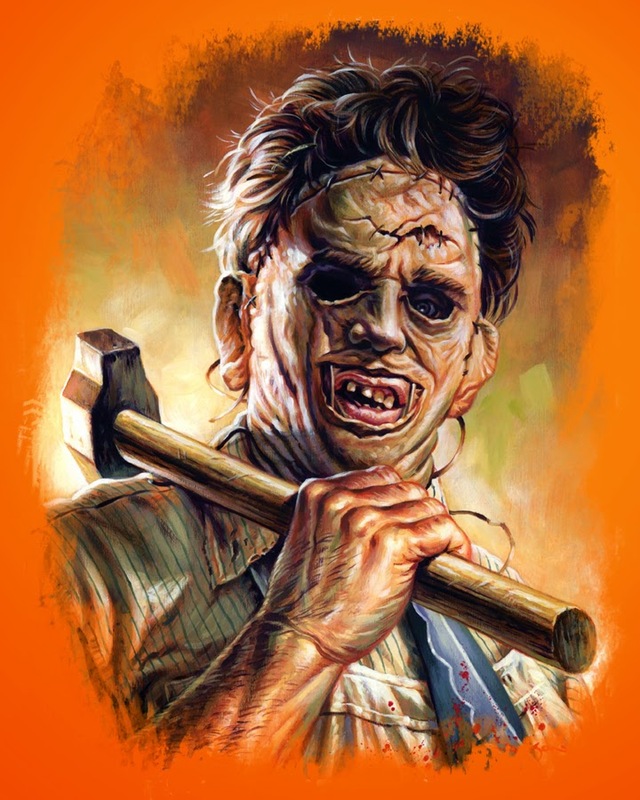 Now helmed by his mother Ronnie Hein, the New York City Horror Film Festival continues Michael’s legacy, bringing revered filmmakers, newcomers, and short film makers together for a long weekend of camaraderie, thrills, and chills. The New York City Horror Film Festival is held at Tribeca Cinemas, 54 Varick St., New York, NY, USA. For more information NYC Horror Film Festival. Helix - Series 1, comes to UK DVD. "HELIX", Sony Pictures Television’s intense sci-fi series, debuts on UK DVD June 30 with the release of "HELIX: THE COMPLETE FIRST SERIES". 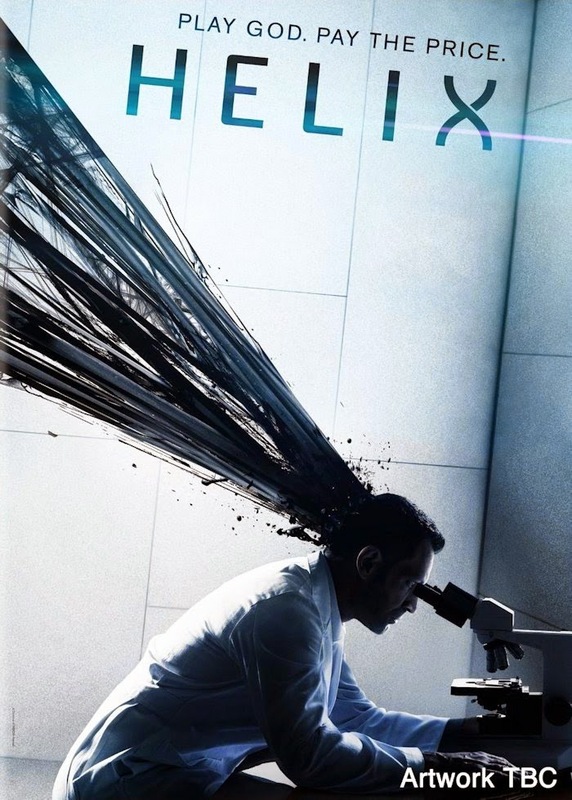 "HELIX" is an intense thriller about a team of scientists from the Centers for Disease Control who travel to a high-tech research facility in the Arctic to investigate a possible disease outbreak, only to find themselves pulled into a terrifying life-and-death struggle that holds the key to mankind’s salvation or total annihilation. All 13 episodes of HELIX will be available on DVD, along with cast and crew commentaries, deleted scenes and four all-new featurettes. -Ronald D. Moore: The Outlier of Science Fiction – An intimate and up close look at Moore’s thoughts for developing a compelling series, his dos and don’ts of sci-fi, and his personal process for creating the new series from his very unique perspective. -The Future of Disease – An all-access look at the research, implementation, and creative use of the mysterious disease of HELIX. -The Art of Isolation – Looks at the Production Designer’s approach to creating the isolated research centre - the key story elements of the setting and the exterior locations used to double for the arctic. -Dissecting the Characters – A study of the characters and the dynamic interpersonal relationships that fuel the series from the perspective of the writers and the actors tasked with breathing life into these unique personalities. 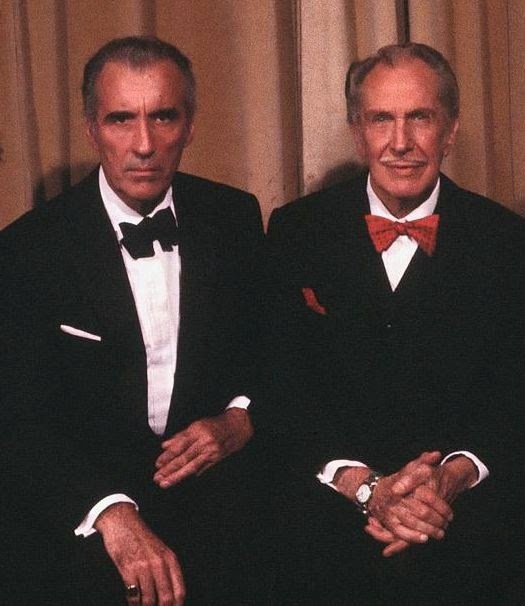 Happy Birthday to Christopher Lee and Vincent Price! Yesterday (May 26th) marked the Birthday of Peter Cushing. But today (May 27th) marks the birthday of 2 more great horror icons. Christopher Lee, who turns 92 and the late Vincent Price, who would have been 103. Today (May 26th) would have been the 101st bithday of the late, great, Peter Cushing. He was not only of the great legends of horror, but also a true English gentleman. 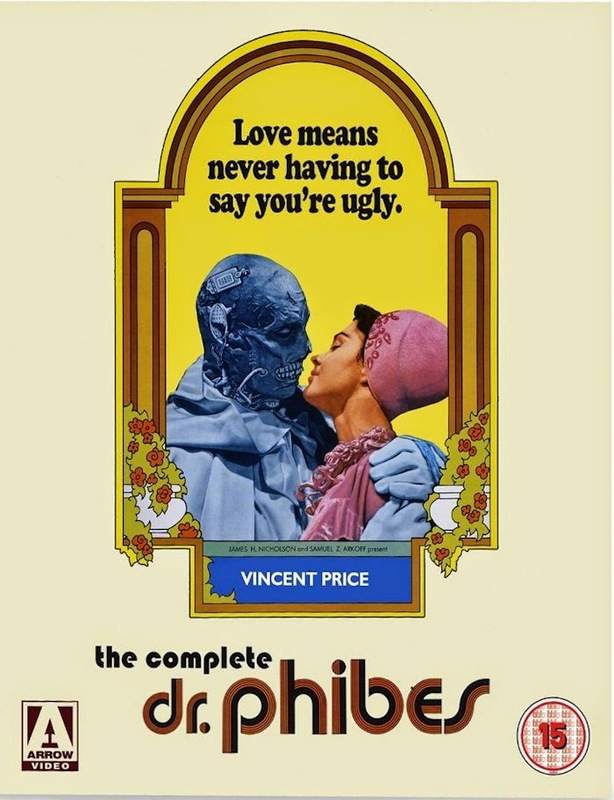 The Complete Dr Phibes comes to UK BD from Arrow films. Coming to UK BD this June. Horror legend Vincent Price (The Fall of the House of Usher, Theatre of Blood) is Dr. Phibes, former musician, current murderer. Seeking revenge from the medical staff that left his wife for dead, he sets about knocking them off one-by-one in a series of elaborate murders based upon a Ten Plagues of Egypt. Death by bats, by boils, by blood and more await the nurse and surgeons who failed to save the life of the beloved Victoria Regina Phibes! The BD box set is released June 9th from Arrow films. Attention budding film makers. Shortcuts to Hell is back with a filmmaking opportunity like no other! They want you to make a 3-minute short film, one that showcases the big idea for YOUR DEBUT FEATURE FILM… a debut feature film that can be realized on the most restrictive of budgets. This year Horror Channel, Movie Mogul and FrightFest have teamed up with Wildseed Studios on the hunt for the most promising newcomer to the horror genre. 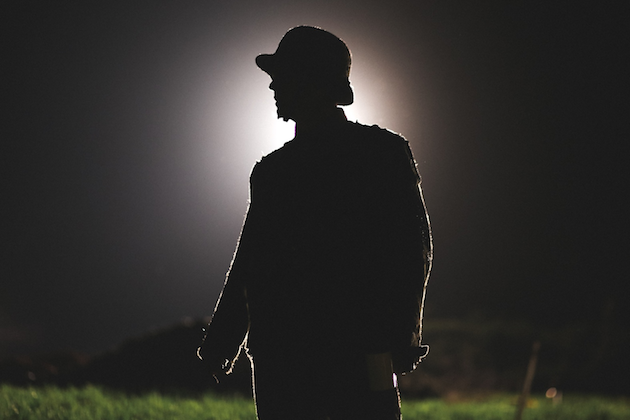 Impress our judges with your short film, talent and feature idea, and you could be in with a chance of directing your first feature film in 2015, with a minimum cash production fund of £20,000 from sponsors Horror Channel and Wildseed Studios. The clock is ticking! Submissions must be delivered in full by 6pm on 22nd July 2014. The Circus of Horrors are taking their "London After Midnight" show on tour throughout the UK this summer. Inspired by the film of the same name, the story twists and turns with grisly murders and sensational shock’s – all interwoven with some of the greatest and most bizarre circus acts on earth, sword swallowers, knife throwers, daredevil balancing acts, astounding aerialists, a dwarf strong man, a Guinness World Record holding ‘hairculian’ hair hanging beauty, sinister sisters, gyrating & fire limboing acrobats, dislocating contortionist & much more. Performed by an almighty cast with a forked tongue firmly in each cheek and the devil driver rock n’ roll of Dr Haze & The Interceptors from Hell. The Circus of Horrors – London After Midnight is on tour throughout the UK. For more information checkout their Official Website. Stuart Gordon’s classic 80s gorefest “Re-Animator” comes to UK Blu-Ray and DVD in a special edition this June courtesy of Second Sight films. Loosely based on the tale by HP Lovecraft, the film takes place at Miskatonic University hospital (the setting of many a Lovecraft tale), where gifted student Herbert West (played by a young Jeffrey Coombs) claims he has invented a glowing green goo that can bring the dead back to life. Unfortunately, when he and his room mate Dan Cain (Bruce Abbot – “Bad Dreams”) start testing it out on the bodies in the morgue, things predictably go awry and blood soaked carnage ensues. The hospitals resident lecturer Dr Hill (David Gale) subsequently tries to steal Herbert West’s formula, only to get himself decapitated in the process. Then matters escalate further when Dr West decides to see if he can reanimate his body and head separately. Only for the, now headless Dr Hill decides to make off with Dan’s girlfriend Meg (Barbara Crampton – “From Beyond”). Culminating in another blood soaked confrontation in the hospital morgue as Herbert and Dan attempt to rescue Meg from Dr Hill and the army of zombies he’s now commanding. Exceptionally gory and very darkly humoured (how many other films do you know featuring a decapitated head giving “head”?) this one was initially very heavily censored for its UK theatrical and VHS release by the BBFC back in the 80s (who clearly didn’t get the humour) and was cut by varying degrees for all subsequent DVD releases right up until 2007, when the censors finally relented and passed it uncut. This release by Second Sight is of the original uncut version and looks to be the definitive version thus far in terms of extras, containing 2 versions of the film, plus a whole stack of supplemental material. The Integral version of the film (Blu-Ray only), which is the uncut version with the deleted and extended scenes spliced back into it. These are also viewable separately, and run about 21mins. Also viewable separately is a deleted dream sequence of Dr West re-animating Meg (3.5 mins), which does not feature in the integral version. There are also a number of features carried over from previous releases, such as interviews with Director Stuart Gordon and Producer Brian Yuzna (48 mins), Writer Dennis Paoli (10 mins), Composer Richard Band (15 mins) who provides an additional 16 minute “Musical discussion” feature in which he talks us through the scoring of several key scenes (16mins) and there’s an interview with Fangoria editor Tony Timpone (4.5mins). 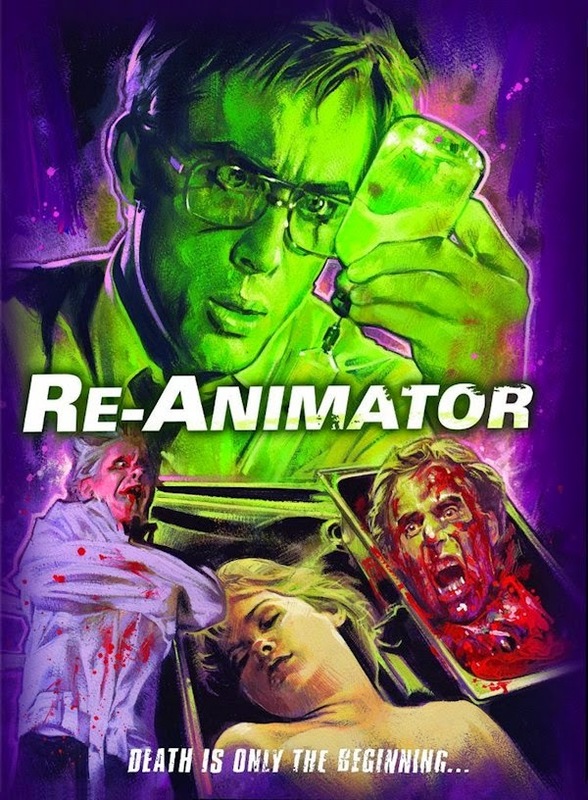 New to this release though is a brand new documentary “Re-Animator Ressurectus”, which is a one hour retrospective documentary about the genesis of the film, featuring interviews with all the main cast and crew including Stuart Gordon (director), Brian Yuzna (producer), John Carl Beuchlar (SFX), Barbara Crampton (Megan), Bruce Abbot (Dan) and of course Jeffrey Combs (Herbert West), which is arguably worth the price of the disc alone. Also included are 2x Theatrical trailers and 5x TV spots, which all play together as one feature (aproximately 6.5 mins in length) and there's 2x behind the scenes and production stills galleries. If you haven’t seen Re-Animator before (and if not WHY not? ), then I would strongly urge you to pick up this release by Second Sight. The Blu-ray version is simply stunning, which is available in a limited edition steelbook case and there’s also 2-disc DVD version available, which contains the exact same extras on (minus the intregal version of the film), so the choice is yours. But either way, if you want to see this, or are looking to upgrade, then you’ll be more than happy with this release. 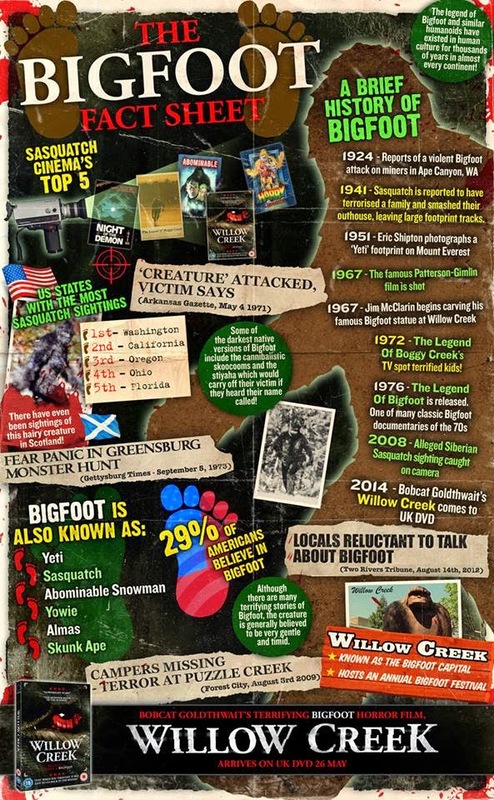 "Willow Creek" - Bigfoot infographic. "Willow Creek" is released to UK DVD May 26th from Kaleidoscope entertainment. 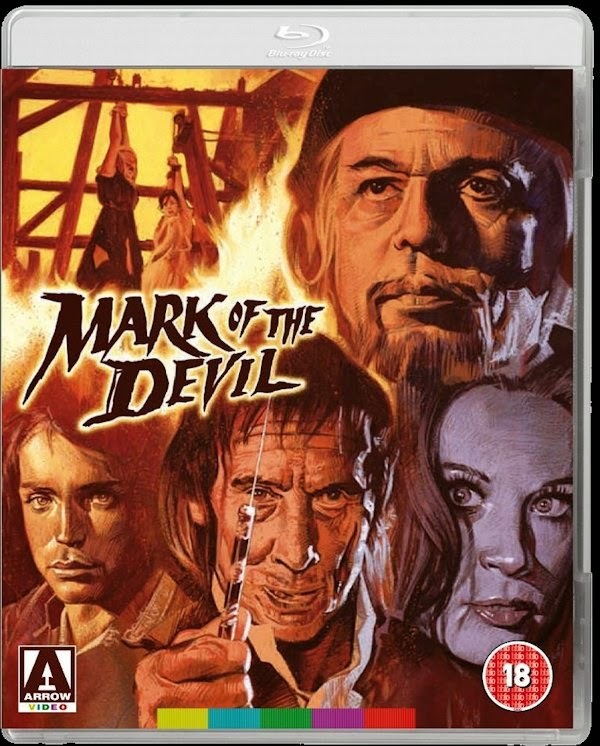 Once proclaimed as “positively the most horrifying film ever made”, "Mark of the Devil" finally arrives uncut in the UK in a special Limited Edition 3 Disc Blu-ray & DVD set from Arrow films. A bloody and brutal critique of religious corruption, Mark of the Devil sees horror icon Udo Kier ("Flesh for Frankenstein", "Suspiria") play a witchfinder’s apprentice whose faith in his master (Herbert Lom - "Asylum") becomes severely tested when they settle in an Austrian village. Presided over by the sadistic albino (a memorably nasty turn from Reggie Nalder - "Salems Lot"), the film presents its morality not so much in shades of grey as shades of black. Written and directed by Michael Armstrong, who would later pen "Eskimo Nell", "The Black Panther" and "House of the Long Shadows", this classic shocker has lost none of its power over the years – especially now that British audiences can finally see it in one piece. - Newly created and exclusive content including interviews with cast and crew! - Collector’s booklet featuring new writing on the film and more! 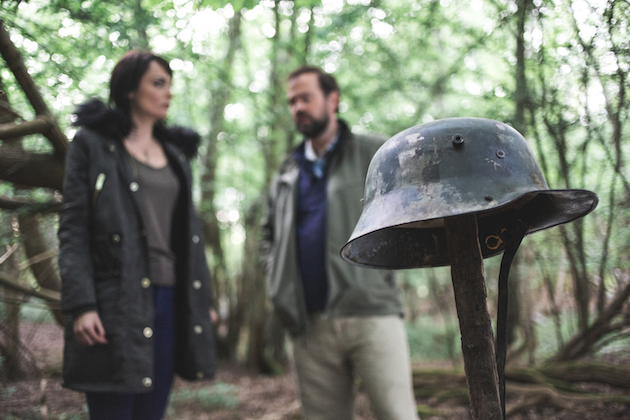 Anchor Bay Entertainment UK have released 2 exclusive stills from the homegrown production of World War Dead. The film follows, a TV Documentary team travelling to the Somme to put together a ratings smash about new mysteries relating to the famous World war 1 battle. However, what they unearth is far from a new story of those that died 100 years ago – but an army of the undead and a brand new war. Starring Ray Panthaki (28 Days Later / Kidulthood). Wendy Glenn (You’re Next) and Kacey Barnfield (Resident Evil/ Green Street 3). These exclusive stills give a first look into the much anticipated film due out early 2015. Arrow films were nice enough to send me another one of their Blu-Rays to review. 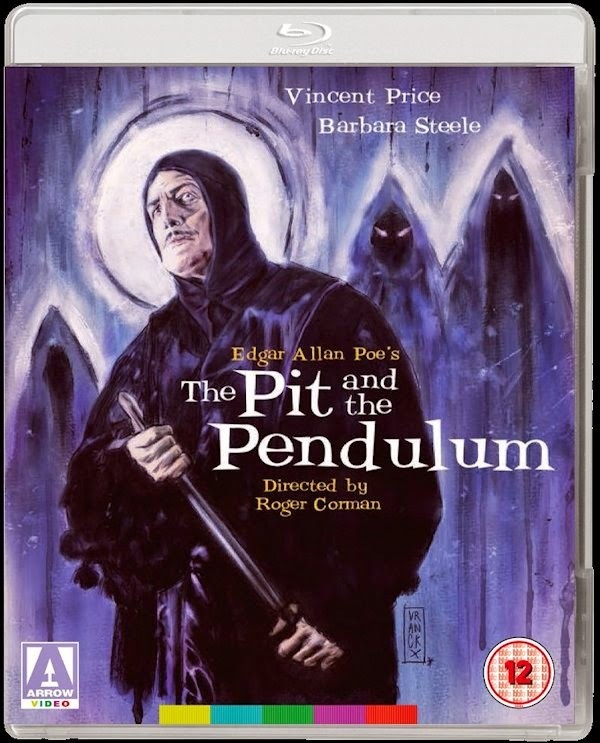 This time its their release of the classic Vincent Price, Roger Corman film “Pit and the Pendulum”. This 1961 adaptation of Edgar Allen Poe’s short story takes place in Spain during the 16th century, where Englishman Francis Barnard (John Kerr) has come to visit the old castle of his brother in law, Nicholas Medina (played by horror icon Vincent Price), to find out what’s happened to his sister Elizabeth. It turns out that she quite literally died of fright whilst exploring the old castle. Seems the old place has a very bad history, as it was previously used by the Spanish Inquisition and still has its own torture chamber in the cellars. The devices where also used by Nicholas’s father to kill his mother and uncle, after he caught them having an affair. An act that still haunts him to this day. However, they get the impression that Elizabeth (played by fellow horror veteran Barbara Steele) might have made a ghostly return as Nicholas claims he can hear her voice in the night and strange music can be heard in parts of the castle. Could this have something to do with the castle’s grisly past, or is some elaborate trickery afoot? Intended as a follow up of sorts to "Fall of the House of Usher", both of which being based on stories by Edgar Allen Poe, directed by Roger Corman and starringVincent Price. The film is your classic gothic horror tale and is definitely one for lovers of older horror films. This is the first time the film has been released to Blu-Ray in the UK, which has been given a new hi-definition (1080p) transfer from original film elements. 2x Audio commentary tracks that accompany the main feature. The first, with director Roger Corman. The second, with film critic Tim Lucas. “Behind the Swinging Blade” feature, in which Roger Corman and Barbara Steele discuss the making of the movie. Vincent Price’s daughter Victoria shares her memories of her fathers time on set and fellow director Brian Yuzna discusses his love of the film and his 1991 version of the story. Additional TV scene. An extraneous 5 minute scene shot to pad the film’s running time for its showing on the US TV networks, which features star Luana Andrews. “An Evening of Edgar Allan Poe” feature. Arguably my favourite feature on the disc, which is 52 minute TV special in which Vincent Price reads various Edgar Allen Poe stories in front of a live audience. Including The Tell-Tale Heart, The Sphinx, The Cask of Amontillado and (of course) The Pit and the Pendulum. Also included is the original theatrical trailer and you can also listen to the films music score and special effects on a separate audio track. The case also contains a full colour collectors booklet, containing linear notes on the film by gothic horror author Johnathon Rigby, illustrated throughout with original stills and promotional artwork. The film is available in both a standard BD case, which contains reversible sleeve artwork, with the original theatrical poster art on one side and newly commissioned artwork by Gilles Vranckx on the other. And in a limited edition Steelbook case. So if you’re a Vincent Price fan, or you love Edgar Allen Poe adaptations, this one is definitely worth picking up. Makes an excellent companion piece to “Fall of the House of Usher” (also available from Arrow films). 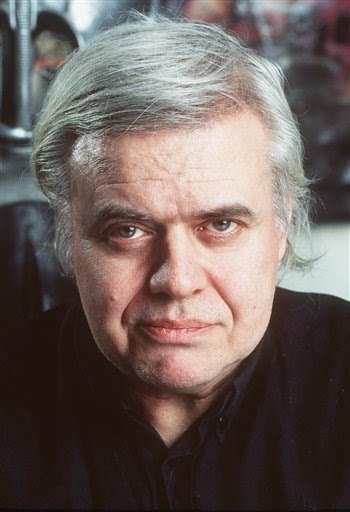 Very sad to report that Swiss artist H R Giger, who designed the creature for Ridley Scott's "Alien" has died. Various news sources have said that Giger died in hospital on Monday, after accidentally falling down the stairs at his home in Zurich. He was 74 years old. As well as creating the titular "Alien" for the 1979 film which starred Sigourney Weaver, he also designed the alien Sil for the movie "Species", starring Natasha Henstrige, in 1995. He also provided the artwork for the theatrical poster of the 1985 low budget sci-fi/comedy "Future Kill" (AKA Night of the Alien). His work has also graced the album covers of such artists as Emerson Lake and Palmer, Debbie Harry and Steve Stevens. He is survived by his wife, Carmen Maria Scheifele Giger, who runs a museum, dedicated to his work, in Gruyeres, Switzerland . 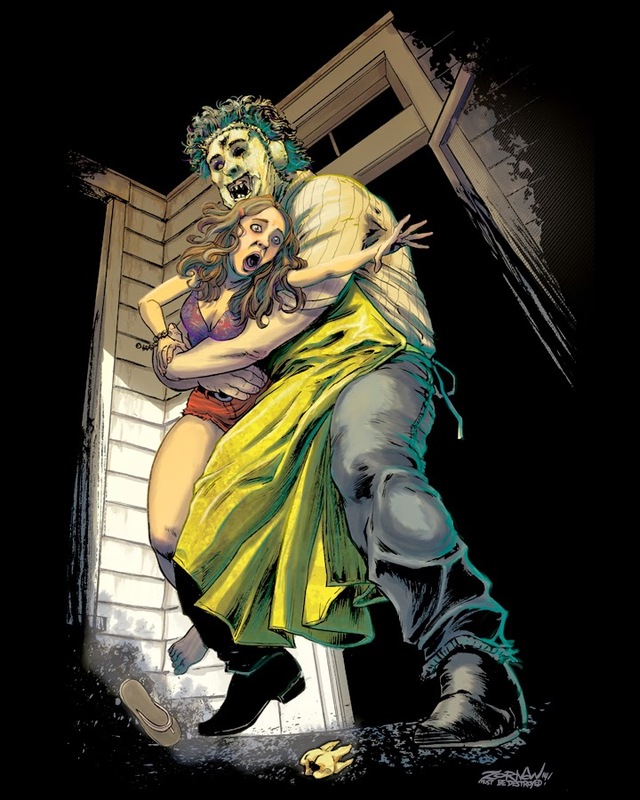 This year marks the 40th anniversary of The Texas Chainsaw Massacre, and Fright-Rags is celebrating with five new shirts! 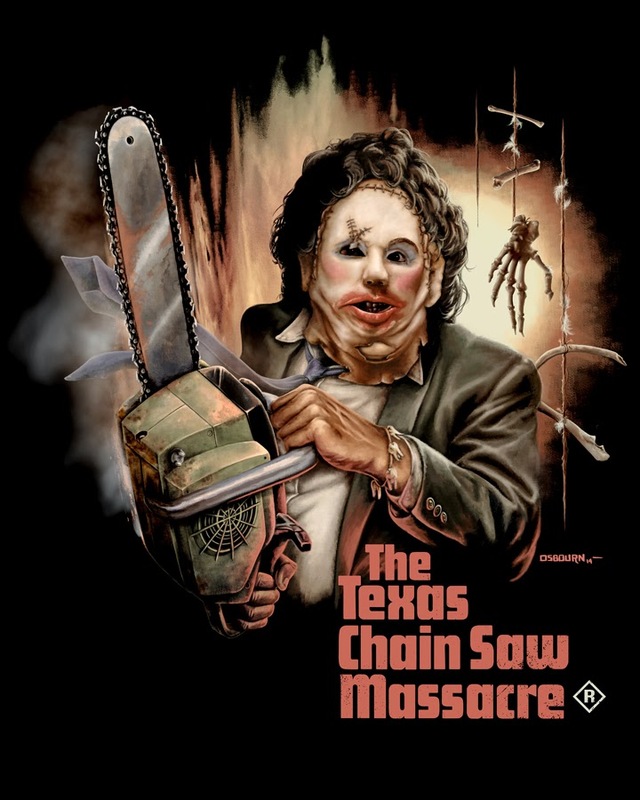 The horror shirt company commissioned five renowned artist to pay homage to Tobe Hooper's 1974 genre-defining classic. 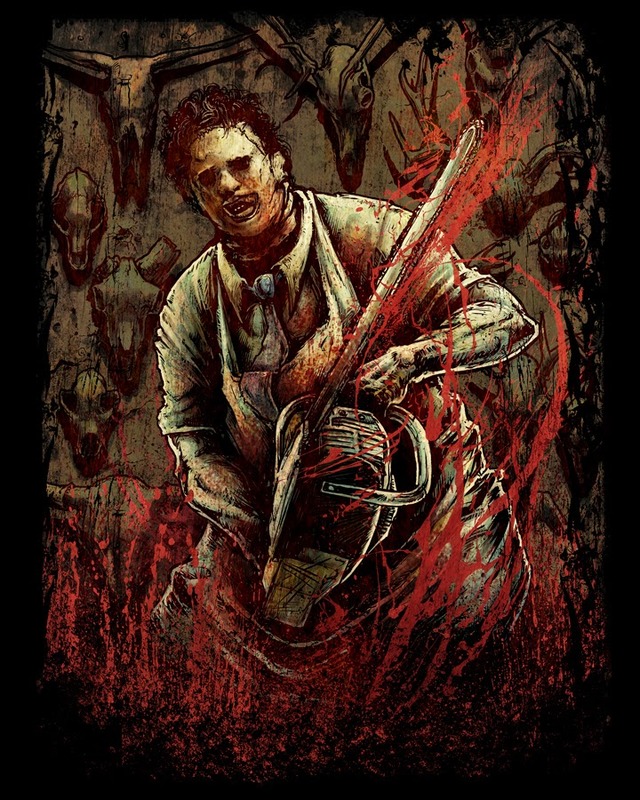 Godmachine, Jason Edmiston, Justin Osbourn, Abrar Ajmal and Jeff Zornow each offer a unique take on The Texas Chainsaw Massacre's iconic madman, Leatherface. All five designs are available on both unisex and girls shirts, but each one is limited to 500 pieces. Pre-orders have launched on Fright-rags.com. These designs will be available until 10am EST on Friday, May 16. Due to the limited nature of the products, they may sell out before the pre-order period ends. Orders are expected to ship in late-June. Order these designs at Fright-rags.com. 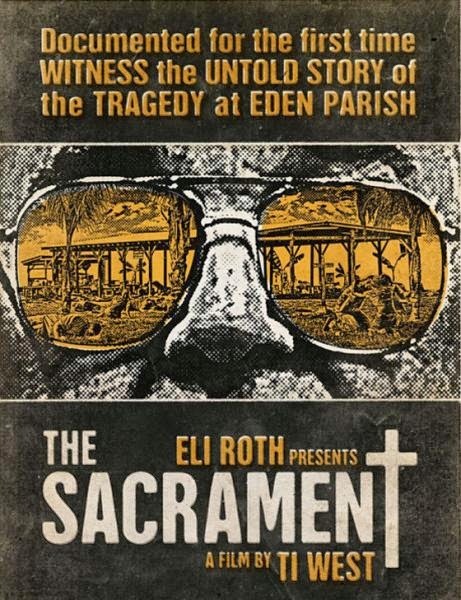 Coming to UK cinemas and on VOD this June, from acclaimed writer/director Ti West (HOUSE OF THE DEVIL) and master of horror Eli Roth (HOSTEL, CABIN FEVER) , THE SACRAMENT examines the last days in the life of a religious cult via West’s unique brand of smart, slow-burn terror. THE SACRAMENT follows two ill-fated Vice Media correspondents as they set out to document their friend’s journey to find his missing sister. Travelling outside of the United States to an undisclosed location, they are welcomed into the world of remote commune “Eden Parish,” a self-sustained rural utopia, comprised of nearly two hundred members. At the center of this small, religious, socialist community is a mysterious leader known only as “Father.” As their friend reunites with his sister, it becomes apparent to the newcomers that this paradise may not be as it seems and underneath the supposed harmony lies a dark and terrifying truth. What started as just another documentary shoot soon becomes a race to escape with their lives. Artfully blending old-school 1970’s-style horror with a chilling psychological study of religious fanaticism, THE SACRAMENT relentlessly builds into an atmosphere of engulfing dread that gets under the skin and stays there. The film is released in the UK June 6th. Philip Mora’s 1982 monster movie “The Beast Within” is released to UK BD & DVD this month from Arrow films, uncut in the UK for the very first time. The film stars Ronny Cox (“Robocop”, ”Deliverance”) and Bibi Besch (“Star Trek 2 : The Wrath of Khan”) as newlyweds Eli and Caroline MacClearly. When their car breaks down on a country road, the husband hikes off to find help. But shortly afterwards, the wife is attacked and sexually assaulted by a strange creature that emerges from the woods. 17 years later and the couples teenage son Michael (Paul Clemens - “Communion”) is dying from some strange genetic disorder and they are faced with the fact the lads father might actually have been her attacker on that fateful night. Not wanting to see their son die, they head back to the small town where the incident occurred, to see if they can track down her attacker and find out what it is that's killing their son. But shortly after their arrival, their son disappears from the hospital and several townsfolk are brutally slaughtered by what looks like a wild animal. Seems some of the townsfolk have been harbouring a dark secret, which is about to catch up with them. As someone is out for revenge and they’re about to discover that the past never says buried forever. Written by Tom Holland (Fright Night) and also starring R G Armstrong (Predator) this was a bit of a strange film, as it had all the makings of a werewolf film (indeed, director Philip Moira worked on “Howling 2 & 3”) BUT the monster wasn't actually a werewolf. It was a person who's turning into cicada (one of those chirping cricket type insects) of all creatures. Overall a very good movie, but I’d never heard of a Were-cricket before this film, but I guess there’s a first time for everything and I couldn’t help but wonder if David Cronenberg didn’t borrow a few ideas for his 1986 remake of “The Fly” from this. Audio commentary track with director Philip Mora, moderated by horror journalist Callum Waddel. The Making of The Beast Within, which is a 45 minute retrospective documentary on the making of the film, featuring interviews with writer Tom Holland and actors Paul Clemens, John Dennis Johnston and Katherine Moffat. Storyboarding the Beast – A 13min feature in which Director Philip Mora runs through the films storyboards, explaining how they filmed the movie. An image gallery of various promotional stills and behind the scenes photos. And lastly there’s the original theatrical trailer. The case also contains a collectors booklet, featuring linear notes on the film by journalist Lee Gamblin, which is illustrated throughout with production stills and promotional artwork and the sleeve features reversible cover art, with the original theatrical poster on one side and newly commissioned art by Marc Schoenbach on the other. Previous UK releases of this film had been cut by the BBFC, this release by Arrow marks the first time the film has been released uncut and available on high definition Blu-Ray here. This release is a dual format combo pack edition, which also contains the DVD. Both discs having the same extras on. If you liked “American Werewolf in London” and “The Howling” then you’ll undoubtedly enjoy this. Though remember the creature isn’t actually a wolf, so be prepared for that. Couple of vids I posted on the old YouTube channel recently. A behind the scenes video of my time on the set of upcoming thriller "No Reasons" and an interview with it's director Spencer Hawken and lead actor Daniel Peacock. 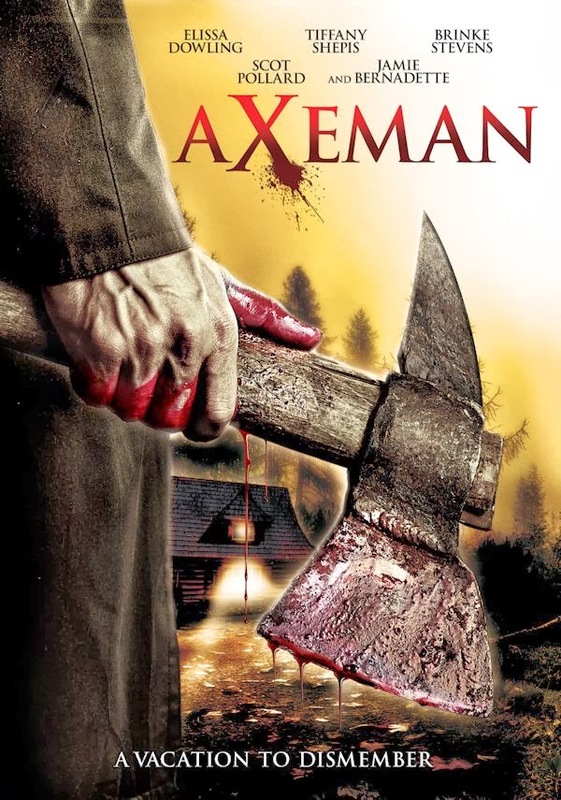 Indie slasher “Axeman” (AKA “Axeman at Cutters Creek”) has just been released to DVD and VOD in the US and Midnight releasing where kind enough to send me over a copy to take a look at. Set in some rural backwater of the US, a group of nine former school friends (who are all supposedly in their 20s, but don’t look a day under 35) rent out an old cabin for a weekend of partying. Aping the basic plot of many an 80s slasher movie (in particular the “Friday the 13th films), this is a very low budget affair and the casts acting does leave a bit to be desired in places, despite the fact that several of the cast, Brinke Stevens, Tiffany Shepis and Elissa Dowling are all established actors. Whilst former professional Basketball player Scott Pollard seemed to be genuinely enjoying himself in his role as the titular Axeman, the gore effects where very much a hit and miss affair, with some interesting kills mixed in with some dodgy CGI and duff effects. I wasn’t sure about some of the attempts at black humour either. 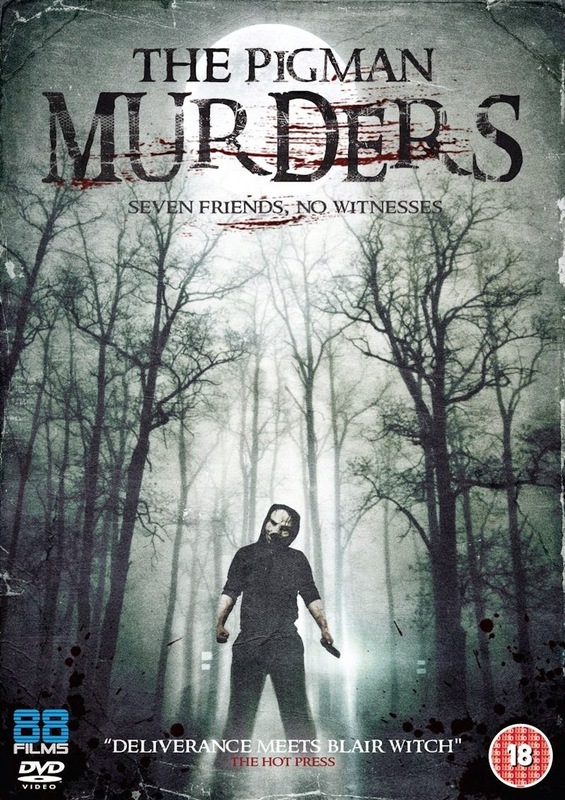 To summarise, if you’re a fan of low budget indie films and you like 80s slasher movies you’ll probably enjoy this, but otherwise this is not the film for you. The films is currently out on US DVD (my screener copy was devoid of extras, unsure if the release version will contain any) as well as being available on VOD from sites like Redbox. Checkout the trailer for indie sci-fi horror "The Drift" from Backyard productions (apparently, this was filmed locally to me). For more info visit the official Website, Facebook and Twitter pages. 88 Films to release "The Pigman Murders"
Stephen Patrick Kenny’s "The Pigman Murders", is coming to UK DVD this September from 88 films. 7 friends head to the wilderness of Connemara, Co. Galway for a weekend break to celebrate the first year anniversary of a close friend. First night in they come across a beaten and bloodied male looking for help as he warns them that two masked men attacked him and took his girlfriend. Some of the group head into the wooded area in search as others return to their cars which have disappeared. With no houses for miles and no transport they must walk themselves back but are not alone! All caught on camera “The Pigman Murders” is a intense rollercoaster that will bring documentary style to another level. Mark Hutchinson, Tom Ward, Camille Yourell, Gerard Fallon, Andrew Neenan, Marius Puodziunas, and Eugene Horan star. 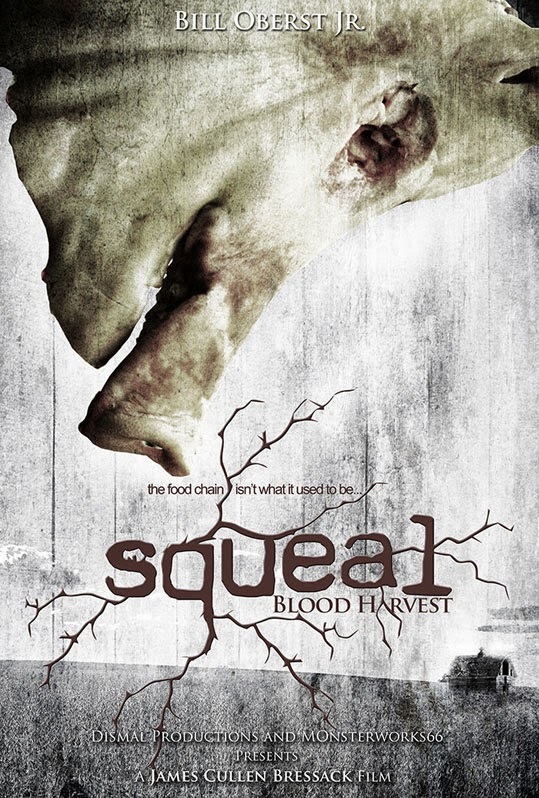 James Cullen Bressack to direct "SQUEAL: Blood Harvest"
The production team of upcoming horror feature, "SQUEAL: Blood Harvest" has officially announced that horror director James Cullen Bressack has officially signed on to direct the psychological horror thriller. “I’m very excited to be a part of this awesome project and to push the envelope to a place it hasn’t been yet.” said Bressack in response to inquiries about his involvement in the much anticipated release. Bressack is known within the indie horror film industry for his work on such films as "13/13/13", "Hate Crime", and "Blood Lake". He first exploded onto the scene at the age of 18 with the success of his first feature "My Pure Joy" and has been generating a considerable amount of buzz ever since. "SQUEAL: Blood Harvest" follows the story of young Maggie Crane and her brother Jake as they attempt to unravel the mystery behind Jack’s recurrent nightmares of squealing pigs. After a move to their Uncle Ollie’s farm, Maggie and her camera further explore the dark and sinister foundation of her brother’s fears to the tune of chilling revelations. More details will follow as additional details about the film are released. For more information, be sure to visit the official Facebook and Twitter pages. One of America's foremost homes for horror, Midnight Releasing has picked up the highly-anticipated fright-flick Blood Widow. The Jeremiah Buckhalt-directed slasher will be available on - among other outlets - Redbox in the US on June 3rd, 2014. A bloody, creepy cocktail that blends the wickedness of A Nightmare on Elm Street with the dark, macabre seasoning of Candyman, Blood Widow introduces us to horror's next major slasher icon - and she's not going away anytime soon! Danielle Lilley, Brandon Kyle Peters, Christopher de Padua, Jose Miguel Vasquez, and Kelly Kilgore star in a Jeremiah Buckhalt film. After buying a nice house in the country, Laurie and Hugh, a successful young couple, throw a party for their friends. During the wild night a few friends decide to explore the abandoned and decaying boarding school next door, only to wake an emotionally broken killer: The Blood Widow. 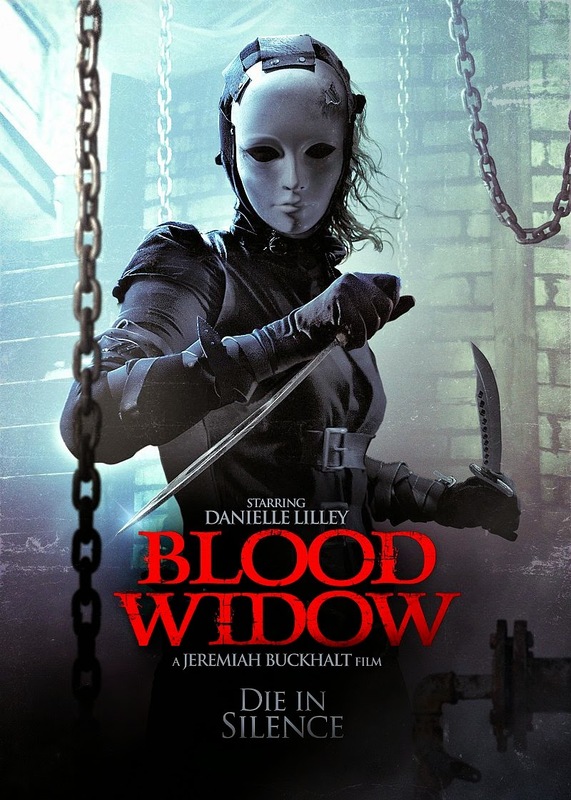 Make a date with the Blood Widow at Redbox on June 3rd, 2014 and on DVD at Amazon.com. 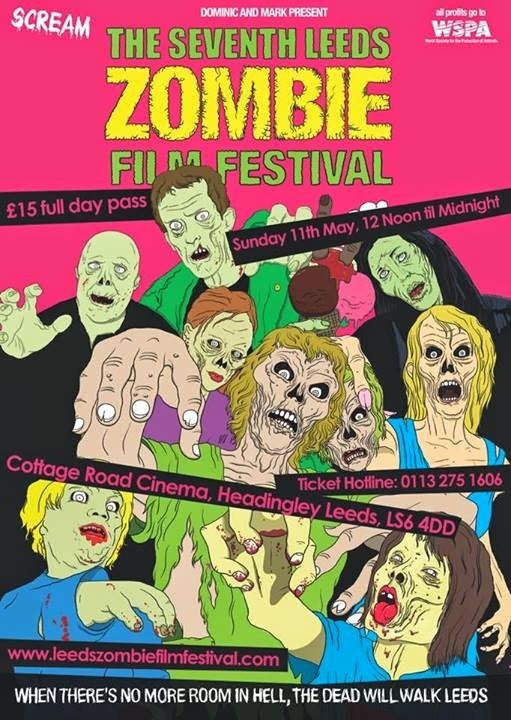 The dead will walk Leeds again on Sunday the 11th May at the Cottage Road Cinema in Headingly for the 7th annual Leeds Zombie Film festival. Emmerdale’s Dominic Brunt and Mark Charnock (Paddy and Marlon) will be presenting 12 hours of daftness and friendly zombie japery, with all proceeds going to the WSPA (World Society for the Protection of Animals). Dominic and Mark will give a short intro to each film and explain why it was chosen. The movies will be both old and new, giving fans of zombie culture a chance to see classics from the past on the big screen for the first time and some more recent contributions to the genre that may have passed many fans by. World War Z (Extended gory version). Night of the Chicken Dead (errrrmm). ...and a load of really really amazing zombie short films from around the world. Please be aware that the Leeds half marathon is taking place during the morning. The roads should be clear by the start of the festival, but check their website nearer the time just in case. The Expendables of Horror "Smother" Louisiana in May! One for US horror fans. Actor and filmmaker John Schneider (Dukes of Hazzard, Lake Placid 2) has rounded up some of horror's most famous faces for "Smothered", premiering in New Orleans in May. The highly-anticipated fright-fest, which features the likes of Kane Hodder, Don Shanks, R.A Mihailoff, Bill Mosely, and Brea Grant , boasts the largest number of horror icons ever to grace the screen at the same time. Smothered, written and directed by Schneider, sees the horror icons playing themselves in a scenario that sees them attending a small, disheartening horror-convention on Friday the 13th. Running out of patience but principally money, the group accept a cash-offer to go and scare-up the local RV park - but things take a surprising, dark turn when they arrive. The tables are turned as the monsters of the movie screen become the prey! A recent sneak preview resulted in glowing reviews across-the-board. Smothered will premiere in Louisiana, where the film was shot and Schneider's Fairlight Films is now located. The premiere, being held at the Sheraton New Orleans Hotel on Friday May 16, encompass a pre-screening social hour and post-screening Q&A with Schneider. Members of the film's cast and crew, as well as city dignitaries are expected to be in attendance. 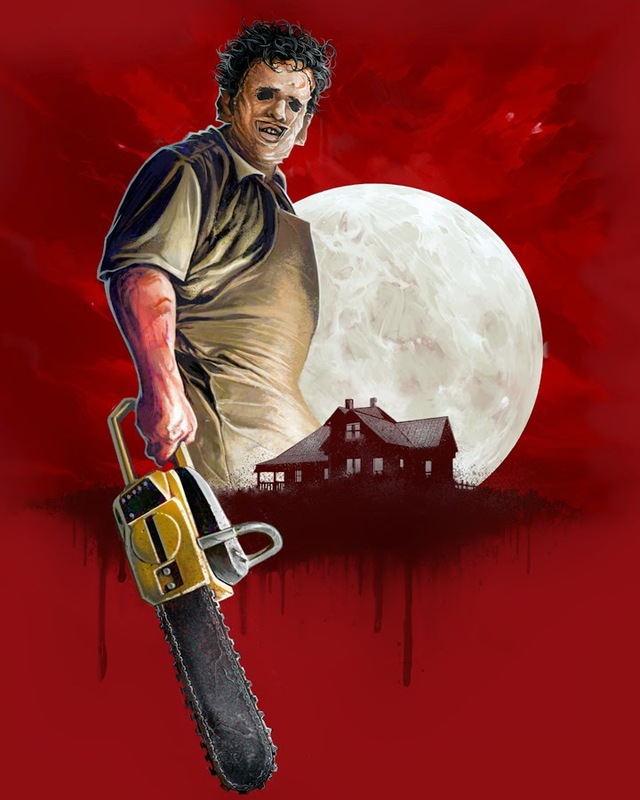 Smothered, also featuring Michael Berryman (The Hills Have Eyes), John Kassir ('The Crypt Keeper' from "Tales from the Crypt") , Dane Rhodes (True Detective), and Shanna Forrestall (The Last Exorcism), is due for release late 2014. Visit the films official Facebook and Twitter pages. 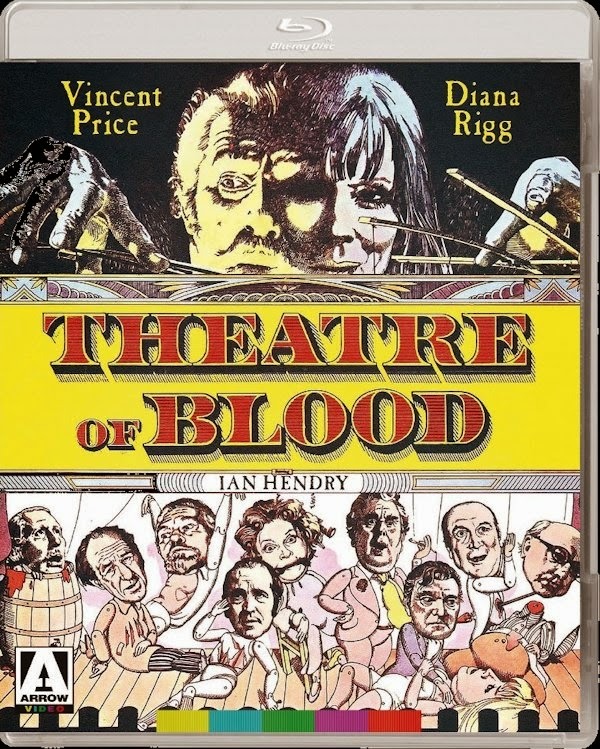 "Theatre of Blood", starring horror legend Vincent Price, comes to UK BD this month from Arrow films and I got an advance look at it. In this, Vincent Price plays Edward Lionheart. A Shakespearian actor who doesn’t take criticism of his performances lightly. After being passed over for one award too many, it was believed he’d committed suicide. But unfortunately for the members of the critics circle, they suddenly find that someone is out for revenge for all the bad reviews they gave him. At first they’re unsure of who might be targeting them or why. But as the bodies begin to pile up, they suspect that it must be Lionheart owing to the way they have been killed. The Police do their best to try and protect the remaining critics, but it seems Lionheart, who has enlisted the help of a group homeless winos, always seems to be one step ahead of them (Star Wars fans may recognise Declan Mullholland amongst them, who played the original Jabba the Hutt). Played as a “straight” horror, the story is really more of a dark comedy and Vincent Price seemed to be genuinely enjoying himself in this. As, no doubt, the thought of getting to bump off critics amused him (the film was reportedly his favourite). The film also features a well rounded cast of veteran British actors of their day, including Sir Michael Horden, Arthur Lowe, Ian Hendry, Jack Hawkins and Diana Dors. Diana Rigg (TV’s The Avengers) also turns up in a supporting role as Lionheart’s daughter and comedian Eric Sykes also appears as a somewhat inept police detective, providing the film with some of its lighter moments. Overall I would say the film was great fun. In many ways, it was rather reminiscent of the “Dr Phibes” films, except this time he lives in an old theatre (actually the old Putney Hippodrome) and the story here isn’t quite as dark, though the kills are no less inventive. This film has been out on DVD for a while, but this marks the first time the film has been released on high definition Blu-Ray, which has been newly transferred from original film elements so looks considerably more “polished” than previous releases. The film also comes with the usual bumper crop of extras you’ve come to expect from Arrow, which includes. Audio commentary with The Leaugue of Gentlemen. Yes it seems that the people behind the cult BBC comedy, Jeremy Dyson, Mark Gatiss, Steve Pemberton and Reece Shearsmith are huge horror fans and provide an amusing and insightful running commentary. A Priceless Pot Boiler. Vincent Price’s daughter Victoria recalls her memories about her fathers time on set and discusses her father’s other films. A Fearful Thespian. Author and film historian David Del Valle discusses the film and how this came to be one of Vincent Price’s favourite roles. Staged Reaction – Madeline Smith discusses how she got the part and her time working on set. A Harmony for Horror. In which Composer Michael J. Lewis discusses how he scored the film. Lastly there’s the original theatrical trailer. The case also contains a full colour booklet, containing stills and promotional artwork from the film along with linear notes by Cleaver Patterson and the sleeve features reversible artwork, giving you the choice of displaying the disc with either newly commissioned artwork, or its original theatrical poster art. To summarise, I’d say this release is a must for Vincent price fans, if you’ve never seen this before, or are looking to upgrade your bare bones DVD, then this release by Arrow is an essential purchase. The Blu-Ray was originally scheduled for release May 5th, but due to a glitch on the initial batch of discs, this has been pushed back and is now provisionally scheduled for release May 19th. The film is available in both standard case and in a limited edition Steelbook case. John Vernon (DIRTY HARRY, CHAINED HEAT) and Samantha Eggar (THE BROOD, THE EXTERMINATOR) star in this horror classic from the golden age of the slasher genre. A group of women gather for a weekend casting call at the secluded mansion of director Jonathan Stryker (Vernon). He’s searching for the perfect woman to play the role of the crazed character “Audra”, and these women are just dying for the chance to play her! Stryker’s last star, Samantha Sherwood (Eggar), is so determined to get the part, she committed herself to an asylum to prepare for the role. Unfortunately for all, a crazed killer in a disgusting “hag” mask is viciously murdering everyone one by one. Who will survive the final curtain call? Curtains is released to BD and DVD in the US July 8th from Synapse. Former "Dr Who" to star in new "Terminator" film!